I needed two thank you cards for my convention roomie/friends. I used the July Stamp of the Month, Circus Alphabet (Item #S1407). This is also a sneak peek at the new Shin-Han markers CTMH is unveiling in the August Annual Inspirations Idea Book. I love the way they color! Also a sneak peek at one of the new washi tapes, Topiary (item #Z2002), that is also available in August. I used various CTMH solid colors to make the festive banner for the multi-color card, and Skylark paper for the green card. Notice that I cut one inch squares to stamp the individual letters on – that way if you mess up coloring you can do one letter over and the letters are easy to line up this way. Also, don’t hesitate to stamp letters in a random, wavy pattern if you have trouble lining the stamps up perfectly straight. Perfect is the enemy of good! Have fun with stamping and creating! The Skylark paper pack is available until the end of July (Item #X7177B). Get your favorite papers before the end of July! All of the B&T duos patterned papers will be replaced with exciting new designs effective August 1. 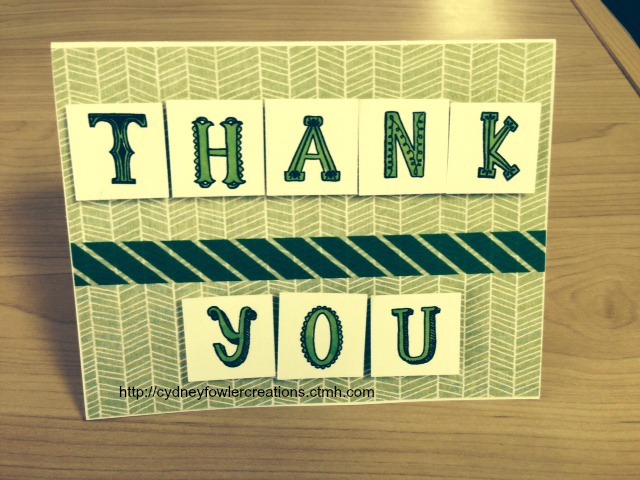 Green Thank You card with the Circus Alphabet and Topiary Washi Tape. 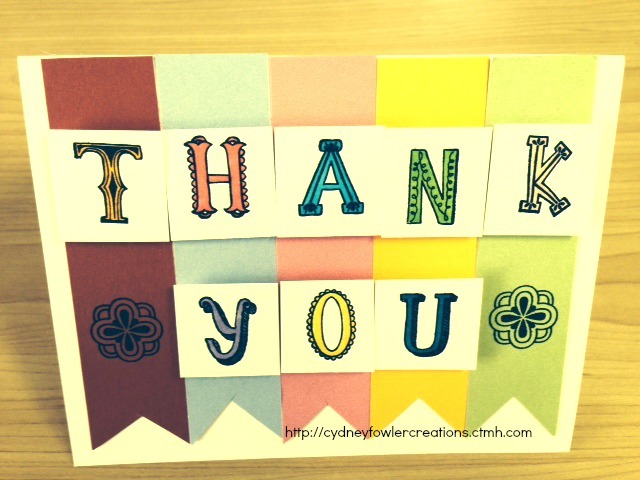 Multi-Color Thank You card made with the Circus Alphabet. Don’t forget – you can only get this cute alphabet stamp set during July. Retail is $17.95, but you can get it for $5.00 with any $50 purchase during July. My personal online CTMH shop is located at http://cydneyfowlercreations.ctmh.com. Click on the link to shop. Thanks for stopping by my blog! Watch for regular posts featuring more wonderful Close to my Heart products. Happy Crafting!